Earlier in the year WUSA -TV, broadcasting from the Washington area in the States, reported that employees in the General Services Administration (GSA) regional office, were sent a memo warning them to not use the restrooms. "DO NOT flush toilets or use any domestic water," WUSA quoted the memo as saying. A woman was taken to the hospital with serious but non-life-threatening injuries after a loo she had occupied exploded. Bearing in mind that this incident did occur in a federal government building, no doubt, somebody wound up deep in the you know what! Earlier in the day, I uploaded an article to our forum titled ‘Going green benefits property prices’ in which Century City in Cape Town, is named as a case of Point. Century City, next to the N1 highway alongside Ysterplaat Air force Base, borders on several low end suburbs with an Industrial area to its back, the land there is also flat and is positioned right in the wind zone, in essence, it wasn’t built in the most desirable location the mother city has to offer. With respect to residential property, it seems as though they have created an oasis in a neighbourhood that historically would not have been considered a sound investment. When I contemplate everything I personally do not like about the area, and consider that people are willing to pay a premium to live there, I have to commend whoever the developers were, for their tremendous vision and foresight. 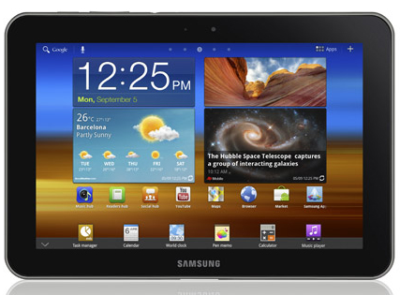 I have for a while seriously been contemplating getting myself a Galaxy Tab. For once I am glad I procrastinated as the deals the various networks are offering have got so much better as they compete for their share of this fast growing market. While I will definitely make use of most of its functionality, the big draw for me is the Kindle application. I like reading and I particularly like the idea of being able to get what I’m looking for on demand at substantially less than bookstore prices, supposing my bookstore actually stocks it. After doing some homework, for various reasons I would prefer to go with MTN. Nonetheless, I did enquire about SKYPE usage and was told that there is a clause relating to it in the contract, essentially they don’t approve of it on this particular device. It seems that the logic is that they would rather you be using your cell and in doings so, will be billed by them for the call. Where the Logic falls flat though, is when your devices are across more than one network. The question I asked the sales lady was would they rather me be using their MTN bandwidth, or my Vodacom phone? She smiled and shrugged. Most weather forecasting models currently in use have resolutions ensuring accuracy to within 100 km which is a great improvement on the accuracy levels of approximately 300 km which were in use 15 years ago. Climate forecasts are based on computer models developed by using physics and advanced calculations and equations aimed at forecasting climate and weather patterns. Presently there is a great deal of international co-operation to co-ordinate weather forecasting globally at any given time by means of advanced computer models. 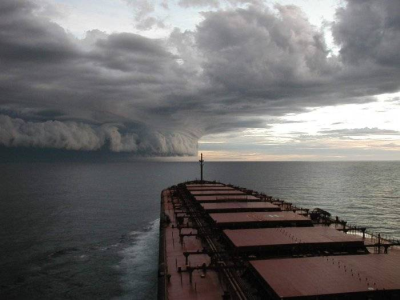 Dr Alan Thorpe, Director- General of the European Centre for Medium Weather Forecasting, recently indicated that with the development of these models it is possible to prepare more accurate weather forecasts. He said that it was anticipated that within a matter of years the levels of accuracy will be down to a few kilometres. This will be of great benefit to economic sectors such as agriculture, leisure and construction and it will also be a useful aid to those responsible for disaster management in times of floods and storms caused by extreme weather conditions as result of the increasing incidence of climate change. 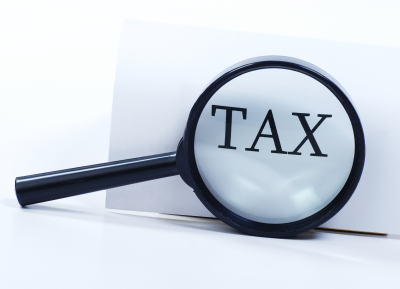 Income tax: Furnishing returns for the 2011 year of assessment. In terms of South African Revenue Service (SARS) Notice No 531 published on 1 July 2011, persons who received income in accordance with the thresholds stated in paragraph 2 of the notice are required to furnish returns for the 2011 year of assessment within the periods indicated in paragraph 4 of said notice. Persons referred to (which include natural persons, trusts and other juristic persons, such as institutions, boards or bodies) are required to furnish returns on or before 30 September 2011 if the return is submitted manually, and on or before 25 November 2011 if the return is submitted in an electronic format, as stipulated in the regulations issued in terms of the Income Tax Act. In the case of persons “2011 year of assessment” means the period ending 28 February 2011. The Association undertakes to disseminate info on relevant IT issues and to also give feedback on some of our current IT projects, particularly where we could provide useful software tools. 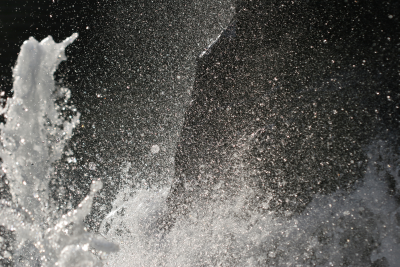 There are 2 projects currently in the pipeline, which may be of interest to companies. The first is a customised reporting facility to 3CX phone systems (http://www.3cx.com/phone-system/). Although reporting facilities exist, very often specialised reporting is required that is not covered in the standard reporting facility. We will be developing a tool initially for our requirements, but which could be used by others in the market place. Another tool we are currently piloting, called MBATalk reflects staff person’s status (in a meeting, off sick, available at their desk, etc.) which is proving very useful. We shall keep you posted. As we already know, on twitter everybody is a comedic social commentator. Once again, we bring you some of the more notable examples of this and ask that you keep in mind, that the views expressed are not the views of the Association. (To Helen Zille) So if a voter isn't on twitter how do they deal with power outages? Can they send you a please call me? You either wear a beret in the John Wayne style or the Monica Lewinsky style. JuJu seems to favour the Lewinsky look. Odd that. Why doesn't the Dalai Lama just slip through the hole in the border fence with Zimbabwe like everyone else?....would save a lot of trouble. Apparently somebody was hit by Gautrain last week which caused some delays - police say a man has been tracked down. Today could be 9/11 for Zuma and Malema - but who is the Tower and who is the Plane? I so enjoyed the Constitution Court reality TV show: "So you think you can judge?" How about "Who wants to be a democrat" live on primetime? Simon Cowell’s girlfriend has moved out of his house. I bet he’s glad to have all that closet space back. Today is International Talk Like a Pirate Day. Ok…’We have your oil tanker and its captain, give us 5 million $’. David Walliams Thames Swim has raised over a million pounds. Please keep giving whatever you can financially & any Immodium you have spare. 8th September 1966. Star Trek premieres on US TV. Hard to believe that show has been entertaining virgins for over forty years. I'm speculating about Madonna's intentions and her new, young boyfriend...marriage or adoption? Steve Jobs announces in addition to Samsung, his company is suing New York for calling themselves The Big Apple. 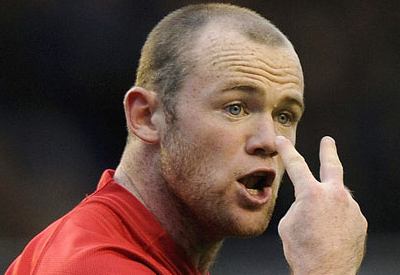 Since his hair transplant Wayne Rooney admits he’s spent more time looking in the mirror. He's named the funny monkey he sees there Bubbles. Sobriety week announced last week, almost passed unnoticed but at least there was a media release issued by the office of the Deputy Minister of Trade and Industry that alcohol abuse could cost South Africa`s economy as much as R9billion a year which amounted to one percent of the country`s gross domestic product (GDP). 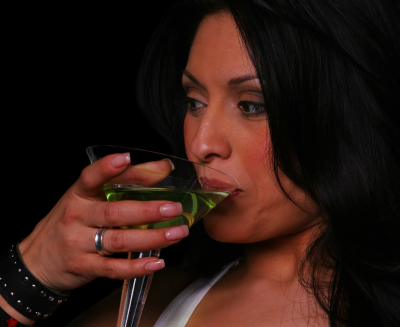 According to the World Health Organisation (WHO), the annual liquor consumption by South Africans amounts to 7.81 litres of pure alcohol per person. This is a scary statistic if account of the fact is taken that a significant percentage of the South African population is below 15 years of age. The sobriety campaign calls on all South Africans to ensure fellow citizens are protected from irresponsible consumption and trading in alcohol. We at Master Builders KwaZulu-Natal have put together a marketing package that allows suppliers of services and products to the Building & Construction Industry, to promote themselves to our members, as well as to the general public. 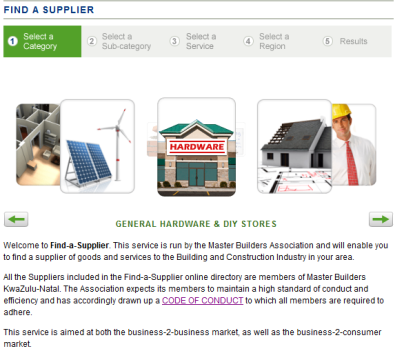 A micro site which is essentially a one page web template on our Find-a-Supplier module, hosted on masterbuilders.co.za. All you need to do is send me your company logo, company profile and a couple of photographs, and I will sort out the rest. Use of our DL flyer management service situated in the new interactive centre at our Westville head office, at 40 Essex Terrace. I will check on it daily to make sure that the flyers you have supplied are neat, tidy and topped up at all times. The other extremely useful “marketing tool”, is to display the Master Builders 'Supplier' logo on vehicles, signage, corporate stationery as well as your website. If you don’t already have the corporate identity proofs, as per our logo policy, please email me. In addition, there are other advertising options available and are on a “pay as you go” basis. Last but not least, if you like what you are reading and are not a member, give us a call and let’s get you onboard, that way you too can make use of the marketing tools we have on offer. The Academic Ranking of World Universities (ARWU) is based at the Shanghai Jiaotong University in the Peoples Republic of China (PRC). For the last eight years, the University of KwaZulu-Natal has been ranked in the top 500 Universities in the World by the ARWU. The ARWU rankings are based on the academic and research performance of tertiary institutions globally. More than 1 000 universities are ranked by the ARWU annually but the names of only the best 500 are published. The ARWU uses a number of objective criteria to rank universities such as the number of alumni and staff winning Nobel prizes and Field medals; the number of highly cited researchers selected by Thompson Scientific; the number of articles published in the journal Nature and Science and the number of articles indexed in the Science Citation Index. 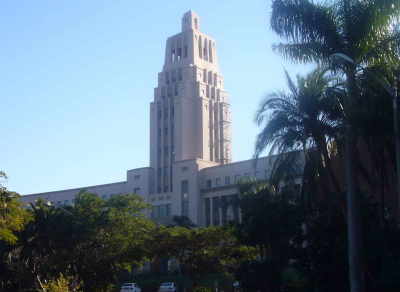 The Universities of KwaZulu-Natal, Cape Town, Witwatersrand and Cairo were the only universities ranked in Africa among the five hundred top universities in the world. After waiting an entire year whilst extensive renovations took place at our Westville premises, we are now beginning to enjoy our new and improved facilities. Alterations which included greening of our building and the creation of new venues to our conference facilities are indeed paying off. A clear indication of this is the large number of bookings we have for training, arbitrations, seminars etc. 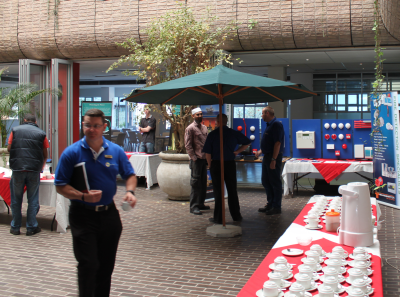 We recently hosted a function for The Fire Detection Installers Association in our lovely open atrium, where various exhibitors displayed their products to enthusiastic visitors. We are now also able to offer onsite catering and our new coffee shop Café Indaba, will be opening shortly. This will become a major networking venue where one can meet over a cup of coffee, have a bite to eat; read the newspaper or quietly get on with some work. When there are major events such as the WORLD CUP RUGBY you will be able to view this on our wide screen TV whilst enjoying a nice breakfast, lunch or a few drinks, depending on what times the games are taking place. Stop in and have a look for yourself. 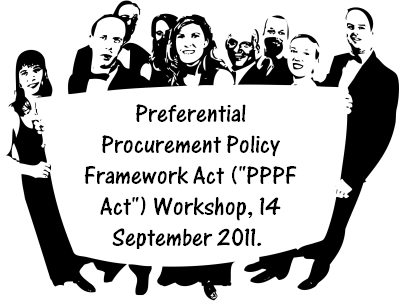 The Minister of Finance recently published new regulations in terms of the Preferential Procurement Policy Framework Act ("PPPF Act") which will take effect on 7 December 2011. 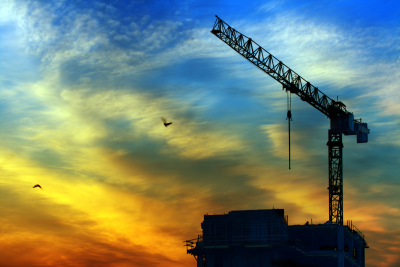 Masterbuilders.co.za recently uploaded a short summary of the new regulations in an article supplied to us by Richard Hoal of Cox | Yeats Attorneys. We would like to invite you to attend a Workshop on the topic, which will be held on 14 September 2011 in association with Cox |Yeats, at the Master Builders Conference Centre in Westville. The Cox | Yeats construction and engineering team, is extensively involved in a variety of tender and procurement law issues and have put together a procurement law presentation which incorporates an analysis of some relevant cases by way of examples. The workshop will start at 2pm and should be about 2 hours. Drinks and snacks will be served after the workshop. Attendance is FREE for Members of Master Builders KwaZulu-Natal. Non-Members are welcome to attend at a cost of R200 per person. Kindly RSVP to Lynda on 031 266 7070 for catering purposes. A one legged South African man has been fined and banned from driving after police stopped his vehicle and showed no appreciation for his ingenuity, in overcoming the small matter of controlling the vehicle's clutch. 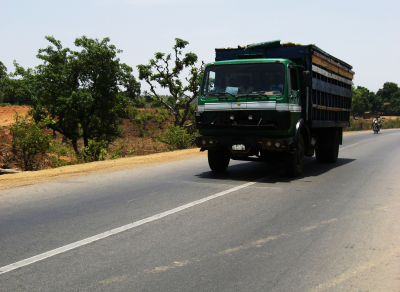 While stopping vehicles at a roadblock, police were shocked to find a driver of a truck (not a car) with only one leg. Chief traffic inspector Merle Lourens reported that she had found the man sitting in his vehicle with his son by his side, the youngster tasked with operating the clutch. The 39-year-old man, whose left leg had been amputated in 1996 after a gunshot injury, would seat the 11 year old boy next to him and shout out instructions as to when to push the clutch in. The truck’s vehicle licence had expired two years earlier and was being driven under an expired learner’s license, specifically for automatic cars. It was also found to have a broken parking brake and seat belt, thus making it unroadworthy. ‘He won’t be allowed to drive, but he shouldn’t have been driving in the first place,’ said Lourens.